A traditional sformato is an old fashioned dish. It’s a dish that takes some time and care to make, involving several steps. The kind of thing many people can’t be bothered with these days. But I think it’s well worth the effort. 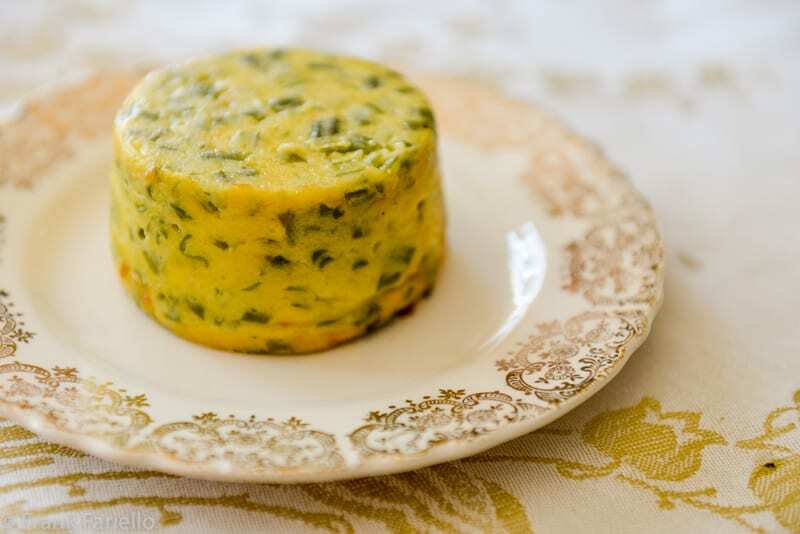 Not quite a quiche, not quite a soufflé, not quite a baked frittata, a formato is made by parboiling then sautéing the main ingredient, usually a vegetable, which you fold into a rich mixture of béchamel, egg yolks and cheese, and then bake in a mold. After a short rest, the sformato is unmolded before serving, either as is or napped in a sauce. A properly made sformato is intensely rich and yet, at the same time, has a sublime delicacy of texture and flavor. We’ve featured sformati before, one with fennel and with tunafish. In today’s post we’ll look at a particularly elegant alternative method for presenting a sformato: as sformatini, baked in ramekins and served individually. The batter for these sformatini is made with green beans, although you could substitute another vegetable or a mix of different vegetables if you prefer. The sformato was originally a piatto di mezzo, or entremet, served between the primo and the secondo courses. Now that the piatto di mezzo has virtually died out as a separate course in all but the most formal settings, these sformatini could serve as an elegant antipasto or, in larger portions, as a vegetarian second course. Boil—or better steam—the green beans in well salted water. When they are fully tender, drain them well and chop into small dice. (Or pulse in a food processor). Sauté the minced shallot in a good pour of oil and a knob of butter just until its aroma begins to waft through the air, then add the chopped green beans. Let the green beans simmer gently for a few minutes, until they have absorbed the flavors of the shallots and butter and any excess liquid has evaporated, seasoning with salt and pepper along the way. Take off the heat and let cool completely. Follow the usual technique with the listed ingredients. (See this post for details, but use 3 Tbs of flour per cup instead of the standard 2 Tbs.) Let this cool as well. Pour the batter into individual ramekins that you’ve greased well with oil or butter, leaving some space as the batter will swell considerably during baking. 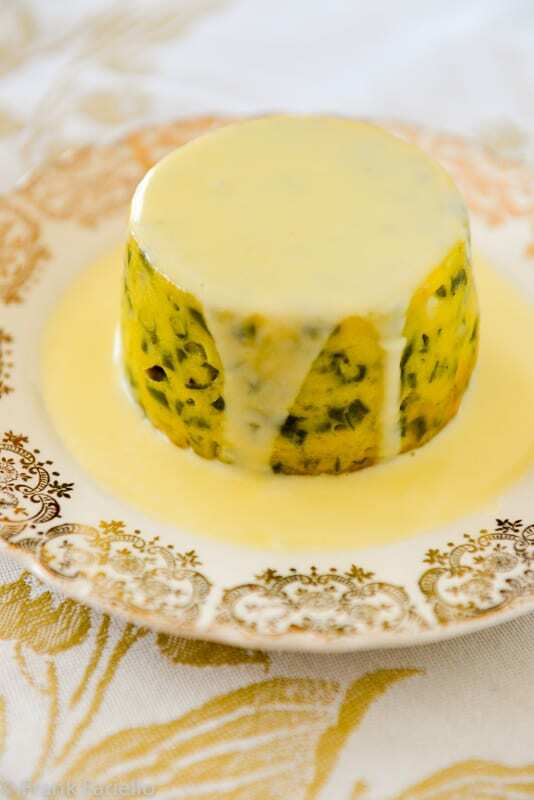 Place the ramekins in a baking dish or tray and bake in a moderate (180C/350F) oven for about 30 minutes or so, until the batter is cooked through and the tops are lightly browned. Remove the ramekins from the baking dish and let them cool, at least for a good 15-20 minutes. (Or you can let them cool completely.) The sformatini should shrink back some and detach themselves from the sides of the ramekins as they cool. Let the cream, along with the grated Parmesan and butter, reduce in a small saucepan until it thickens enough to coat a spoon well. Remove immediately from the heat. Serve your sformatini on individual plates, napped with the cheese sauce. The final rest before serving is key. Not only does it allow the sformatini to cool off a bit, which lets you better enjoy the delicate taste of the green beans and cheese, but the sformatini detach themselves from the insides of the ramekins, making them much easier to unmold. For more tips and tricks, see our post on sformato di finocchi, or Fennel Sformato. If need be, these sformatini could be made entirely ahead and gently re-heated. But having tried it I have to say that, unfortunately, they lose quite a bit of their delicate savor and texture in the process. As mentioned, you can use this same “master” recipe with a wide variety of vegetables. Just replace the green beans with another vegetable or mix of vegetables of your choice, such as mushrooms, carrots, spinach, zucchini, peas… Whatever strikes your fancy. (Some vegetables like mushrooms don’t need or want the initial parboiling—use your common sense.) And besides cheese, some people like to enrich the sformati with some diced cooked ham as well. Some recipes call for whole eggs rather than just the yolks, which results in a firmer texture. Some recipes have you separate the eggs, adding the yolks first, then whipping the whites and gently folding them into the batter just before baking. The whipped whites will cause the sformatini to swell even more than they do ordinarily. I would serve them directly from their ramekins as you would a soufflé, without waiting. Since these sformatini are quite rich, a small portion goes a long way. The ingredients listed here should provide six portions for an antipasto or piatto di mezzo. If you make four larger sformatini instead, you should have portions large enough for an ample vegetarian main course, assuming you’ll also be serving a first course and dessert. You can serve sformatini with or (as pictured at left) “naked” without sauce. The mixture is rich enough that it will be perfectly satisfying on its own, although a complementary sauce does make it even prettier and more elegant. Aside from the simple cheese sauce indicated in this post, a proper fonduta —the Piemontese version of cheese fondue made with fontina—would be perfectly delicious. For a slightly lighter touch, a simple tomato sauce would compliment the taste of the green beans quite well. Instead of individual sformatini, you can also use this recipe to make a standard sformato by baking the batter in a single loaf pan, soufflé mold, flan mold or ring mold. You’ll need to extend the baking time to a good 45-60 minutes, depending on the size and shape of your cooking vessel, but otherwise the method is just the same. And if you want a easy, “down home” version, just pour the batter into a baking dish. You can serve it up straight up, without unmolding it. The presentation won’t be as elegant, of course, but it will be just as tasty. Follow the usual technique (see this post for details) with the listed ingredients, using 3 Tbs of flour instead of the usual 2 Tbs. Let this cool as well. Pour the batter into individual ramekins that you've greased well with oil or butter, leaving some space as the batter will swell considerably during baking. Place the ramekins in a baking dish or tray and bake in a moderate (180C/350F) oven for about 30 minutes or so, until the batter is cooked through and the tops are lightly browned. by letting the cream, with the grated Parmesan and butter, reduce in a small saucepan until it thickens enough to coat a spoon well. on individual plates, napped with the sauce. I’ve done these with asparagus and the results have been grand. My recipe is a bit different so saving yours (never did it with the cheese sauce). Putting parchment on the bottom is genius. I’m sure asparagus is wonderful, especially this time of year! I never prepare sformato or sformatini but often order it, especially when in Italy. String beans being a favorite of mine, you may have just given me the push to try this dish at home. Frank, I look forward to your posts as they are full of essential content and so well written. What a gorgeous dish. I am definitely going to make a version of this for my next dinner party, the fennel one sounds wonderful. Is it appropriate to add chopped shrimp or seafood to the Sformatini? The fennel version would go beautifully with shrimp or scallops. The presentation is absolutely wonderful. I don’t see why not. My only hesitation would be whether the seafood wouldn’t overcook in the oven, but definitely worth a try to find out. How wonderful and so well presented. These are the real Italian recipes which should never be forgotten. I love the simplicity of these sformatini, they must be delicious! I don’t think I’ve seen anything like this, and I have lots of Italian cookbooks! It’s a work of art! What a pretty little dish! I can almost hear the Ooohs and Aaahs from your dinner mates as you bring these to the table. They do make quite an impression, John! How wonderful! I love timbales, and don’t have a good recipe, so thank you so much. Yours look exquisite! Thanks, Jeff! I’m sure you’ll like it if you do give it a try. I’m all for streamlining whenever possible! Will try skipping the pre-boiling next time and see how I like it. è un piatto molto raffinato ed elegante, complimenti Frank ! How beautiful is that?! I wish I could present like that! May I ask what size ramekin would I buy? Any size will work, really. Smaller ones for appetizer, a slightly larger one for a main course. For the ones pictured the molds were 3″wide x 2″deep. Thanks for the catch, Sharon. I was referring to measurements per cup, so you should use 6 Tbs flour and 6 tbs butter. Have clarified the instructions.